(CNS): Although the government and the proposed cruise port developer have only just signed the MOU, the environmental impact assessment has already begun, and once it is complete government will release its findings, MLA Cline Glidden says. While there is wide political support for a development of cruise berthing facilities there are still a number of people who have concerns about the impact the project will have on Cayman’s marine environment, Seven Mile Beach and the islands’ capital, George Town. The EIA must now be completed before the MOU 90-day period elapses, which, according to government and the developer, will mitigate any negative impacts caused by the project. According to the terms of the MOU, the developer must identify a suitable company and then begin the environmental impact assessment within 60 days. However, Glidden, who has been the premier’s direct representative throughout the negotiating process, told the media last week that the MOU partner, Dart Enterprises Construction Company (DECCO), has already begun the assessment. The MOU states that the purpose of the EIA is to “assist in the design of the project with a view to minimising and mitigating wherever possible any negative impacts on the natural environment”. It does not state, however, where or if a line would be drawn on environmental damage. As yet, the name of the firm conducting the EIA has not yet been revealed and the terms of reference are understood to fall considerably short of those proposed by the DoE during the previous administration’s MOU with Atlantic Star. Until now DECCO has not officially consulted the DoE regarding its EIA, but Glidden said that the developer was not in a position to do so until the MOU was signed but now that is the case DECCO will be able to discuss the project with the government department responsible for protecting the environmental interests of the Cayman Islands . However, Cameron Graham, CEO of DECCO, said that the firm was “comfortable with the results so far” of the EIA. While the right to protection of the environment is cited in the country’s Bill of Rights in the new Constitution, that part of the document does not come into effect until 2012, by which time government hopes to have completed the cruise berthing project. Nor does Cayman yet have a law to protect the environment as the National Conservation Bill has still not been brought to the Legislative Assembly. However, Glidden said that the developer recognises that this is a critical part of the project, which is why it had already been started. The West Bay MLA also committed to releasing the document to the public once it was completed. While there are particular concerns in the community about the direct impact on the marine environment and local beaches, there are also other issues as the project requires some reclamation of land in order to complete the piers and upload elements. Glidden stated that as little land as possible would be reclaimed and by using pilings to construct the piers and not solid concrete they would be open and therefore, he said, this would not restrict ocean flows. The $150 million plan may also see the downtown area of George Town Harbour pedestrianized and port cargo traffic diverted. Glidden said they were presented by some challenges because of that cargo traffic but there was hope that it could be predestrianised, creating a more pleasant experience for tourists and rejuvenate the capital. Glidden said that DECCO had already contracted traffic management consultants as part of overall $150 million project. If Doe does the EIA there going to tell the goverment what they want to hear,if not they know its there job on the line. And if Decco gets someone to do it there going to tell the goverment what they want to hear because money talks! Why dont they just use the beloved Boatswain Beach (turtle farm) Parking lot, as the Tourist dock and build up round there since its soooooooooooooo important for McKeeva to keep that. At least they will have some use of that damn forsaken money guzzling place, because no one else (caymanian) cares for it!!! Besides them unemployed and druggies that are always hanging around McKeeva for handouts, will have something to do, instead of sitting around all day thinking up foolishness! In moving the Tourist to West Bay and Boatswaine, that should help to eleviate the traffic in George Town and on the West Bay Road. The key here is to get it right or as right as we can be for as you know nature has a way of fighting back and any mistakes now will be paid for down the line by the next few generations.I hope that the new cargo port will not be needed as this new dock system(if indeed it is built)will be sufficient to deal with off loading cargo at nite when the cruise ships are not in port.A simple co-operation between cruise ships and cargo ships can easily be worked out so that the dock has space at any time it is needed for off loading cargo.Would it no be possible to have one of those huge container ships come in once or twice a month and the smaller ships as per usual.I am saying this as the new reported hospital deal has been agreed to in principal and the stuff needed for such a large project might require more cargo space.just a thought. I am still waiting to hear how we will be able to deal with regular cruise ships coming in while all this building is going on.I have long said that Harbour drive needs to be SHUT down full time and some sort of satelite parking set up on either side of town to alleviate the crazy congestion of cars looking for parking all over GT.Some sort of ring road also needs to be established around GT to make traveling easier for all concerned. They are going to change downtown so that no vehicular traffic is permitted along the waterfront. So how will cargo be moved from the port to the distribution center, since no trucks can get to the port? How are you going to build all the infrastructure, a "ring" road, with all the commercial and public buildings already established? Has no one in Cayman ever played SIM City? You simply cannot plan for the future with willy-nilly planning and construction. You cannot mix cargo with cruise and this country cannot grow and develop based on one single limited draft cargo berth working at night only. Every port in the world works 24/7. We are currently delaying ships for up to 12 hours or more before we can work their cargo at night, We need to move cargo out and away from the centre of town and we MUST develop and Port Development Master Plan that plans ahead in phases over the next 30-50 years of our nation’s progress and not just plan willy nilly for a single 4 year political term. Thanks for your comments but in the meantime this is the ONLY option we have due to lack of funds etc.The cost to move out of the GT area will be prohibitive as far as trucking fees etc.Again I appreciate your thoughts. A tricky situation that has to be down in order to ensure national revenue before the FCO’ deadline. It should be MOU between DECCO and UDP followed by EIA through the DOE, but here’s the delimma: the right to protect the environment is not possible until 2012. The EIA report will be left in the hands of Government and DECCO to do whatever they want! That is my other concern. I hope they find that the movement of sand won’t be hurt. The need for dredging has to be the central issue. 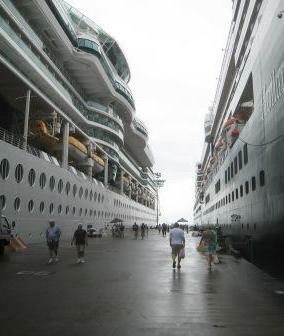 The present generation of cruise ships require a draft of 30 feet, the newer mega-liners require 50+ feet of clearance to accomodate their propulsion pods. Dredging generates silt and particulate which can choke sponge and coral habitats. If DECCO can propose a facility without dredging, then it will be hard to object to it.